Boutique Hotels are so unique and wonderfully luxurious here in the Riviera Maya. If you desire a more intimate setting in a hotel with less rooms and great service then these smaller, luxury hotel could be the best option for you. These beach hotels have a different feel to them than All inclusive resorts or larger hotels. They are known for having excellent, top notch service. You will come to know the staff of your beach hotel by name and they will know yours. Some boutique hotels are located beachfront and some within a few blocks of the beach. However, you will be surprised, there are some amazing beach hotels within a few blocks of the beach that will blow your mind! Actually the top rated boutique hotel in Playa del Carmen is not even on the beach. That is pretty amazing! Boutique hotels sometimes offer a free breakfast but almost always they will not include your meals in the rental price. So keep this in mind when booking one of these great beach hotels. This is also a benefit of a smaller hotel is that you get to enjoy all different restaurants in the area instead of eating at the same few restaurants at the hotel. At boutique hotels, they are small enough where if you desire you can get to know the other guests staying at the same hotel. Playa del Carmen has most of the boutique hotels in the Riviera Maya area but there are some great ones located in other areas of the Riviera Maya. The Tides 5 Star Hotel was rated #1 for best Mexico hotel in 2008 and this year ranked #41 out of the top 100 hotels in the World!!! Boutique hotels usually have super cute entrances that seem to be hidden until you are looking for them. I don't know about you, but I just love that! It's like a hidden gem that you have found! 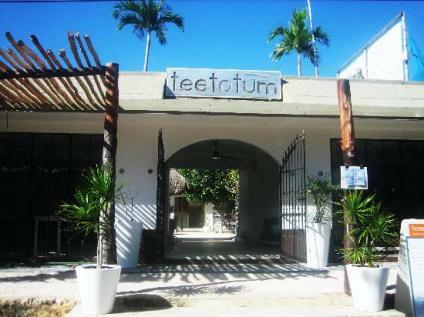 Check out this picture of the entrance to Teetotum hotel in Tulum. It's so picture perfect! From my experience, you are guarenteed top quality service at boutique hotels and a unique experience filled with memories. All are Boutique Hotels 5 star? There are all sorts of smaller, intimate hotels, some that are 5 star and very expensive per night (from $400-$1500), and there are some that you can find for under $100 a night. There is a very big difference in quality of these hotels obviously. Many of the more upscale boutiques have private plunge pools, extra spacious rooms with living areas and more amenities. You get what you pay for! The top of the line boutique hotels will go the extra mile to give you quality service that you will be amazed by. Such as, if you have a child they may notice the age of the child and provide a few extra things in your room at time of arrival that cater to your child. You may also receive a beach bag, upscale liquors in your room and not just a room, but a large suite including living, dining rooms and multiple bedrooms. The boutique hotels that are not as expensive have a very fun, unique and romantic feel to them. They may not have all the extra amenities, but they do offer all the basics that you need in a gorgeous setting that feels quaint. So whatever your budget, you can find a boutique hotel that will fit into it! If you find a boutique hotel that you love but it is not located oceanfront, don't worry! All the boutique hotels that I have found will offer free access to a beach club only a few blocks away for your use! You will have to get there early to get a beach chair but it's so nice to have this option! There are a few beach clubs also on the beach that you can pay about $10 a day to use if you prefer the amenities they offer better. If your wanting to stay in the Playa del Carmen area of the Riviera Maya, I would recommend La Tortuga Hotel or Luna Blue Hotel. Both boutique hotels are in the heart of Playa del Carmen. Neither are beachfront, but their hotel is so amazing that it is worth it. Plus you get to use Mamita's Beach Club for free. La Tortuga has 51 rooms with lots of charm and personality! This beach hotel offers swim up rooms, private rooftop/balcony jacuzzi's on the terrace, all in a setting that is so tropical and full of lush foliage! Luna Blue Hotel is smaller with 18 rooms and is adults only. It's unique amenities include: Treetop terrace rooms, Luna Blue Swing bar, mini suites with kitchen, located on quieter end of Playa. With access to the beach club and a yoga studio across the street, you will enjoy yourself! Luna has Parrothead parties whenever Jimmy Buffet performs anywhere in the world. Complete with home grilled cheeseburgers and drink specials! Here is a picture from the La Tortuga hotel! Tulum is an incredible area that also has several top notch boutique hotels. The Tulum area is great because you have the Mayan ruins there and the beach in this part of the Riviera Maya is bright white! The Ocho Tulum Hotel is a small intimate hotel with 18 cabanas. This hotel is unique because it was built from local materials, and it uses wind turbines and solar for energy. You will come to know the owners, John and Belen, a husband and wife that run the resort. This hotel is beachfront with a restaurant and spa on the premises. Another Tulum boutique quality hotel is Teetotum Hotel. With such a unique name you know your getting a neat hotel! This luxury hotel is very laid back. With a modern and sleek appearance. A stones throw from the beach and with only 4 rooms, you will get personalized service. Read more about this hotel for lots of neat amenities! A very romantic, eco hotel is Cabanas La Luna. Also located near Tulum. With 7 cabanas, and 5 of them right on the beach, and bamboo roofs, you are sure to love this one! There is an open air kitchen if you prefer to cook some meals! Children are welcome at this resort! The Mezzanine Hotel in the Riviera Maya is a 9 room beachfront hotel. With an incredible Thai fusion restaurant and DJ lounge, you will get people coming to this resort even just for dinner! You will love the soft colors, wooden spiral staircase to your loft and high class fixtures. Check out this picture from the Mezzanine in the Riviera Maya. The Riviera Maya has several amazing beaches that are just breathtaking! Some of these beach hotels have found those great stretches of beach to plant their hotel on so you can enjoy these great benefits too! Ceiba del Mar is a charming 45 room hotel. With 2 unique restaurants, 2 swimming pools and it's all beachfront! This quality, upscale small hotel will knock your socks off! If you want the highest level of luxury in a beach front setting, you should go to Zoetry la Bonita! You will be privately chauffeaured from and to the airport in an SUV. Not to mention the resort owns a 48 ft. catamaran that you can use! This resort includes your daily meals as well and you will stay in one of their 90 immaculate beachfront suites. Plunge pools are available at this hotel. Here is a picture of Zoetry La Bonita. The Maroma Resort and Spa is an award winning luxury beach hotel was voted best hotel spa in 2008 from Travel and Leisure. It ranks 5th best hotel spa in the world! 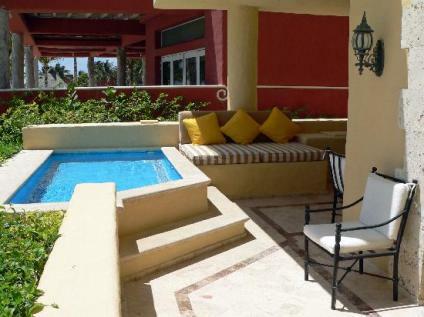 Located on the fabulous Maroma Beach known for white sands and it's very quiet. Palapas and overstuffed chairs are everywhere! Luxury is their middle name! You will pay a bit more, but you will receive the service for what you are paying! You won't be disappointed. I don't think I know anyone who was disappointed by this hotel! The Rosewood Mayakoba is a 1600 acre luxury resort that offers suites on lagoons and beachfront! Even a room on an isolated island! This resort boasts of luxury with it's sliding glass doors, luxury boats that take you to your room, and plunge pools! This one is pricey but you definitly get luxury!!! So many great choices for boutique hotels! If this doesn't sound like what you are wanting, you can check out all inclusive hotels.